Using the average lengths for the courses used on US and European PGA Tour are available on Golf Predictor, the chart above shows the average length of course used on each tour (and on both tours combined) for the 2003-2015 seasons*. A similar post for the 2003-09 seasons is available here). The first seven years on the chart above uses those course lengths from 2009. Years from 2010 on use the latest course lengths in the database (May 2016). Looking at the chart, it's apparent that the courses are getting longer and also that the length of courses used on the European PGA Tour is catching up to those used on the US PGA Tour. Courses for the first seven years were consistently about 100 yards longer than those used on the European PGA Tour, but in the last few years, this disparity has reduced to about 50 yards. The average length appears to stay relatively constant over each period (2003-09 and 2010-15), but that may be due to the fact that only the latest available yardage for each course was used at the end of each period. *Course lengths have been ascertained from official sources where possible. GP seasons (calendar years) are used. The predictions and statistics for this week, the Nordea Masters (European PGA Tour) and the Memorial Tournament pres. by Nationwide Insurance (US PGA Tour), are now available on Golf Predictor. As usual, there's a strong field for Jack's tournament, with half of the world's top twenty teeing it up in Ohio. Meanwhile, the field in Sweden is obviously nowhere near as strong, with local favourite Henrik Stenson once again the marquee name in the event. Chris Wood (ranked 8th by Golf Predictor) won the BMW PGA Championship on the European PGA Tour. The 28 year old Englishman won his third tour title thanks to a blistering front nine on Sunday at Wentworth. Wood went out in 29 to go four shots clear at the tour, but he made his fans (including me, who had backed him at 50/1!) sweat by leaking shots down the stretch. However, he was able to play the par five last conservatively for a closing par to win by a single shot. Our top ranked player, Danny Willett, didn't have his A-game, but still finished third. Overall, we had seven of the top fifteen plus ties (7/21) on the testing Wentworth layout. Jordan Spieth (ranked 1st by Golf Predictor) won the DEAN & DELUCA Invitational on the US PGA Tour. The 22 year old American rediscovered his game to win his eighth tour title by three shots. After struggling last week, Spieth gave another putting masterclass and threw in a brilliant scrambling performance to win his first tournament in his native Texas. Including the winner, we had eleven of the top seventeen plus ties (11/21). The main Predictions (DFS) page (you can now select the tour and all matching tournaments with DraftKings data for the chosen GP season will be displayed). The Field Rankings page (some minor updates for the DraftKings metrics). The Prediction Data page for each golfer (you will now see the DFS panel for European events, if there is DraftKings data for it in the database). The new Predictions (Filter) page (you can now filter by DraftKings metrics for European events). The functionality is exactly the same as for the US tour. You get the same colour coded columns, fair salary calculation and charts. Although it's a bit late now, I have put the DraftKings data for the BMW PGA Championship live. Unfortunately, I didn't know European Tour contests were in the pipeline, so wasn't able to have the site ready in time as a result. However, I was able to use this first covered event for testing purposes! When you're looking at a DFS chart (e.g. DraftKings salary over the GP Season) on the Prediction Data page for a golfer, the data shown may now be from both tours for golfers who play on both tours. The Masters and the WGC - Cadillac Championship are also on the European Tour, so they will appear in the list of tournaments for that tour in 2016 on the main Predictions (DFS) page. You may now have to set the default tour in your profile (My GP menu), if you are only interested in the DFS stats (and most other stats) for one tour. Other pages (such as the Compare pages and the charts) did not need updating to work for European Tour events. These changes make it easy to analyse European PGA Tour events for DraftKings contests on Golf Predictor. Like the DFS golf analysis for US PGA Tour events, non-subscribers can only see golfers ranked 11-25 in the prediction rankings. Therefore, sign up today and reap the full benefits of Golf Predictor, the premium professional golf statistics site. Filtered Field Stats now on Golf Predictor! 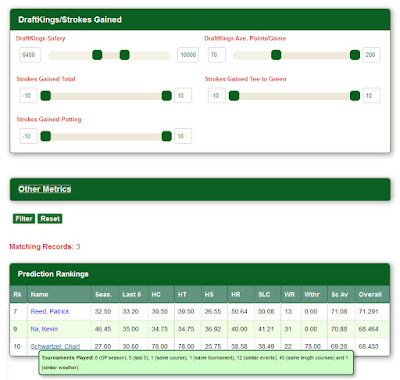 I am very excited to announce the addition of a great new 'Filtered Prediction Rankings' page to Golf Predictor. As can be glimpsed in the screenshot above, this new page is similar to the existing 'Custom Prediction Rankings' page and is available from the same 'Predictions' menu in the Member section. However, while the 'Custom Prediction Rankings' page has a mere 10 vertical sliders and 10 text boxes, this new page contains a whopping 52 horizontal sliders with two handles and two text boxes each! 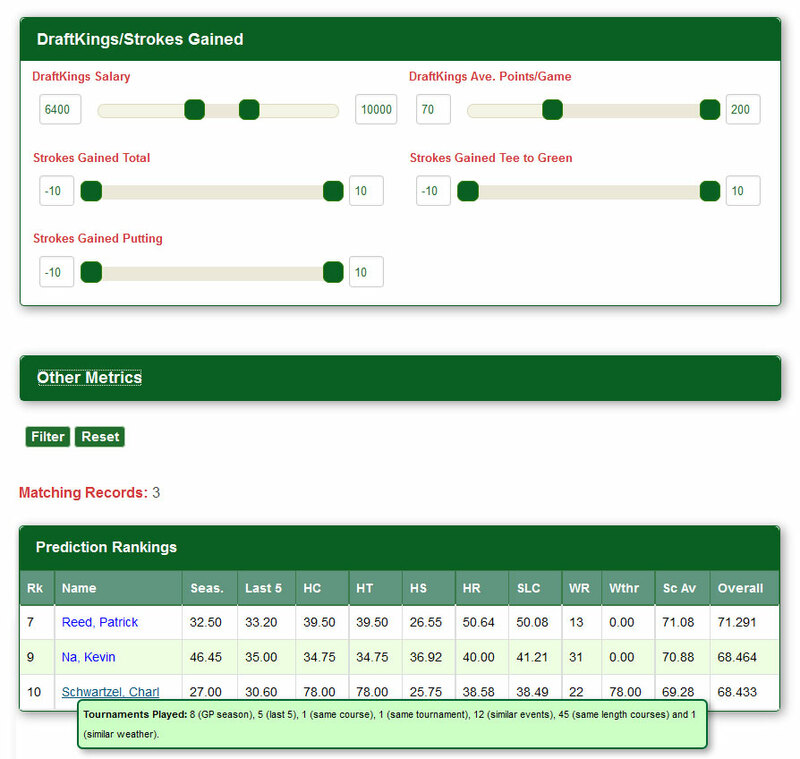 In addition, the 'Custom Prediction Rankings' page reordered the entire field while this new page allows you to identify golfers with certain statistics of your choosing. For example, you can easily list the golfers in the field who are ranked in the top fifty in the world rankings, have at least three top tens this GP season and no missed cuts on the course in the previous five seasons. US PGA Tour Specific (DraftKings and shots gained metrics). Update: DraftKings now available for the European Tour also, so this panel has been renamed. Simply adjust the filter slider ranges as desired (subject to point two below) and press the 'Filter' button to filter the field accordingly. The upper slider value cannot be less than the lower one. You are not allowed to do this by the system either when adjusting the sliders directly or using the text boxes (see below). If you would prefer, you can bypass the sliders and input values directly into the text boxes either side of them. Note that you should only enter numbers between the ranges displayed on the sliders into these boxes. There is validation on these boxes to ignore text and correct numbers that are out of this range. This validation also prevents the lower value being bigger than the upper value. If you do not adjust a slider (e.g. leave it at its default range at either end of the slider), it will not be used in the filtering. Therefore, just adjust the sliders of the metrics you are interested in and ignore the rest. The filters in the DraftKings/Strokes Gained panel were initally ignored when applied to European Tour events. This changed for the DraftKings filters, as they now offer contests for European Tour events and is now covered on Golf Predictor. All sliders are graduated in units of one, except for the DraftKings salary (100) and the strokes gained sliders (0.5). In all cases, the textboxes are rounded to the nearest graduation point. Your filtered rankings are just displayed on this page and not saved. This means that if you were to click on a link as usual (e.g. to a golfer prediction data page) and return to this page via the browser's Back button, your filtered rankings will be lost. Because of this, the golfer prediction data links on this page open up in a new browser window. If you want to return to this page, I recommend right-clicking on any other link (e.g. the tournament page link) and opening the page in a new tab/window. The number of matching results is displayed above the table showing the filtered field stats. This defaults to "50+" if there is more than one page of matches. You can only filter the predictions for tournaments with no results in the system (i.e. the current week's event(s) before the results are inputted). This is because this new functionality could be relatively resource intensive and not to be "wasted" on old tournaments! The 'Filter' button will therefore be disabled for completed tournaments. This is one of the rare pages on the site where the front end (i.e. the large number of sliders!) took considerably longer to develop than the back end! I've been able to make some improvements to the Custom Predictions page while developing this new page. The most noticeable one is that the golfer name is now displayed in a single column in Lastname, Firstname format. This is to help prevent panel overflow when golfers with long first and last names are on the same page. There are 52 metrics to filter by, which is far too many to display in the table showing the matching field stats. Therefore, the table displays the same stats as the Custom Predictions page for the matching golfers. I have tested this new page, but with 52 different filters and the associated logic, it is possible something sneaked in through the cracks. Please contact me immediately if you experience any problems on the page. Just another way to make Golf Predictor even better! This new page is a terrific addition to the site and should greatly assist you in analysing the field for an event. You can now easily isolate good picks for the upcoming tournaments using whatever metrics you deem the most important. As this is a premium feature which will expose golfers outside those ranked 11-25 by the GP algorithm, only subscribers can filter the tournament field. Non-subscribers can access the page, but the 'Filter' button will be disabled. So, sign up today and reap the full benefits of Golf Predictor, the premium professional golf statistics site. The predictions and statistics for this week, the BMW PGA Championship (European PGA Tour) and the DEAN & DELUCA Invitational (US PGA Tour), are now available on Golf Predictor. It's the flagship event on the European Tour this week, but worryingly for the tour, more and more of the European stars are skipping the event in England. However, at least they have Masters champion Danny Willett headlining the field. There isn't a particularly strong field in Texas either, where Jordan Spieth will be hoping to have his swing back under control after misfiring at the Byron Nelson. Rory McIlroy (ranked 1st by Golf Predictor) won the Dubai Duty Free Irish Open Hosted by the Rory Foundation on the European PGA Tour. The 27 year old tournament host secured an emotional first home open in difficult conditions at the K Club. Despite taking a three shot lead into the final day, McIlroy was overtaken by Russell Knox on the fifteenth hole. However, the Northern Irishman produced a blazing finish and won by three shots mainly thanks to a brilliant eagle on the last. Including the winner, we had nine of the top nineteen plus ties (9/22*) in the rain (and hailstone!) affected event. Sergio Garcia (ranked 4th by Golf Predictor) won the AT&T Byron Nelson on the US PGA Tour. The 36 year old Spaniard won his ninth tour title in a play-off with Brooks Koepka. Garcia finished strongly to catch the faltering American and after Koepka made a mess of the first extra hole, Garcia won the event for a second time. Our top ranked player, Justin Spieth, battled with his game, but still finished in tied 18th. Overall, we had nine of the top eighteen plus ties (9/23) in total. *Levy withdrew, thus promoting Olesen into the top 22 of the GP Rankings. The predictions and statistics for this week, the Dubai Duty Free Irish Open Hosted by the Rory Foundation (European PGA Tour) and the AT&T Byron Nelson (US PGA Tour) are now available on Golf Predictor. There are several big names teeing it up in Texas this week, where local hero Jordan Spieth once again leads the challenge in the Byron Nelson. Meanwhile, here in Ireland, Rory McIlroy is headlining the tournament he is hosting at the K Club this year. Jeung-Hun Wang (ranked 5th by Golf Predictor) won the AfrAsia Bank Mauritius Open on the European PGA Tour. The 20 year old South Korean won his second tour title in a row in windy Mauritius. Fresh off his maiden win last week, Wang was the only man in the entire field who shot par or better for the four days. He still needed some help though from runner up, Siddikur Rahman, who dropped three shots late on to let the Korean back in it. Our top ranked player, Scott Hend, had a poor final day, but still finished tied 12th. Overall, we had twelve of the top eighteen plus ties (12/26) in the weak fielded event in difficult conditions. Jason Day (ranked 1st by Golf Predictor) won The Players Championship on the US PGA Tour. The 28 year old Australian world number one grabbed his third title of the season with an impressive wire to wire victory at Sawgrass. After opening with a 3 (-9), Day proved to be most adept on the viciously fast greens and won by four strokes in the end. Including the winner, we had seven of the top nineteen plus ties (7/22) in an event where a lot of the bigger names floundered on the slick greens. The predictions and statistics for this week, The Players Championship (US PGA Tour) and the AfrAsia Bank Mauritius Open (European PGA Tour) are now available on Golf Predictor. As usual, there's a very strong field for the so called "fifth major" in Florida, with forty six of the top fifty in the world rankings teeing it up. That doesn't leave much top talent for the European Tour, which heads back to Mauritius, albeit to a different course. Despite the exotic location in the Indian Ocean, only seven golfers are inside the top one hundred in the world rankings. Jeung-Hun Wang (ranked 10th by Golf Predictor) won the Trophee Hassan II on the European PGA Tour. The 20 year old South Korean won his first tour title in only his thirteenth start on Tour, defeating Nacho Elvira in a play-off. Wang produced a miracle up and down on the first extra hole to deny Elvira, who had hit two fantastic shots to reach the par five last hole in two. The Spaniard's misery was complete when he found trouble of the tee on the next hole and Wang secured the title with his third birdie of the day on the eighteenth hole. On a wet final day on a difficult new course, only nine players finished under par for the tournament. Our top ranked player, Alexander Levy, finished in tied 34th and we had only four of the top sixteen plus ties (4/21) in the difficult conditions. James Hahn (ranked 130th by Golf Predictor) won the Wells Fargo Championship on the US PGA Tour. The 34 year old American overcame a streak of eight missed cuts in a row to capture his second tour title. Hahn beat Roberto Castro on the first extra hole after both had finished on -9. Our top ranked player, Rory McIlroy, finished strongly for tied 4th, but was too inconsistent yet again. Overall, we had seven of the top seventeen plus ties (7/23) in total on the tough Quail Hollow layout. The predictions for this week, the Wells Fargo Championship (US PGA Tour) and the Trophee Hassan II (European PGA Tour), are now available on Golf Predictor. There is a strong field at Quail Hollow where nine of the top fifteen in the world are teeing it up, led by world number three, Rory McIlroy. This week's event also sees the welcome return to action of Jim Furyk, who has been been out with a wrist injury since last year. Meanwhile, in Morocco they have to make do with barely two of the top one hundred in the rankings, both of whom have flown in from China. That, coupled with the different course this year, makes this particular event very difficult to call. Hao-Tong Li (ranked 57th by Golf Predictor) won the Volvo China Open on the European PGA Tour. The 20 year old became the second Chinese golfer in a row to win his home open with a great final day performance in Beijing. Li attacked the course on the final day, firing a 64 (-8) to win by three shots in the end. He had some help from runner up Felipe Aguilar though, who double bogeyed the par three sixteenth after a very poor tee shot. Our top ranked player, Joost Luiten, finished in tied 44th, and we had seven of the top nineteen plus ties (7/20)*. Brian Stuard (ranked 119th by Golf Predictor) won the Zurich Classic of New Orleans on the US PGA Tour. The 33 year old American won his maiden tour title in a play-off against Jamie Lovemark and Byeong-Hun An. In a tournament beset by heavy rain and shortened to 54 holes, Stuard defeated Lovemark with a fine approach to the second extra hole after An was eliminated at the previous hole. Although Stuard had gone bogey free for the tournament, Lovemark will be kicking himself for three putting the last from distance in regulation to fall into the play-off. Our top ranked player, Jason Day, finished in tied fifth and we had thirteen of the top twenty plus ties (13/30) in the weather affected event. *Uihlein retired, promoting Bland into the top 20 of the GP rankings.